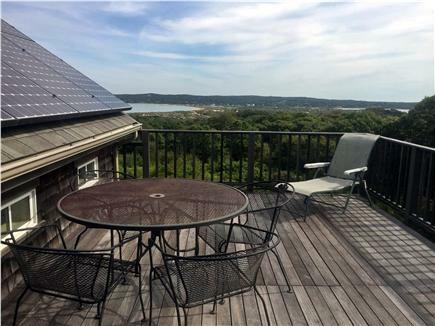 Set on a hill overlooking Vineyard Sound and Menemsha Pond, this lovely contemporary yet traditional home offers privacy, water views and a short walk to to 2 beaches. Lobsterville Beach on Vineyard Sound is a prime bass and bluefishing venue. 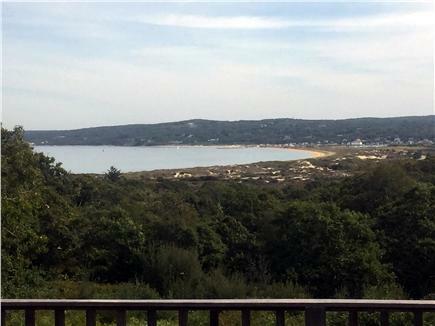 The beach at Menemsha Pond, a salt water inlet, is a favorite with families with small children and boaters. A 2 mile drive takes you to the Gay Head Cliffs, the island's most dramatic scenic vista, and to the surf beaches of the Atlantic. Or take a short ride to the bike ferry to Menemsha, a picturesque fishing village with shops, restaurants, fish markets and a grocery store. Small boat rentals and fishing charters are available nearby. 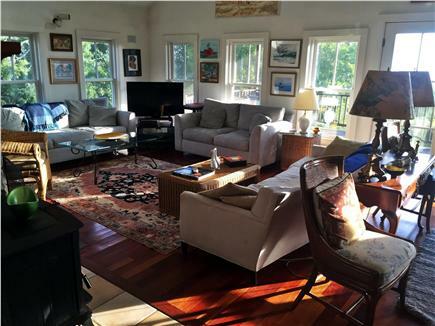 The open floor plan on the first floor with a large deck is ideal for casual entertaining. The master bedroom has a private roof deck with a great view. Additional availability info: March-December on request. This is a Saturday to Saturday vacation rental. Additional pricing info: Security deposit $500 or 10% of rental, cleaning and trash fee $250, State and local taxes of 5.7% will apply. A lovely home in a peaceful location with wonderful views. The house was extremely clean, and well stocked. The a/c came in handy a few days, but most of the time we had a great ocean breeze to match the views. A great place to stay. Jim was also terrific to work with; very helpful and pleasant. Fantastic!! Gorgeous house, beautiful views! We love staying at this house. Jim is a great landlord and we look forward to coming back every year . The views are fantastic, the location is excellent, and we miss it the second we leave each year. 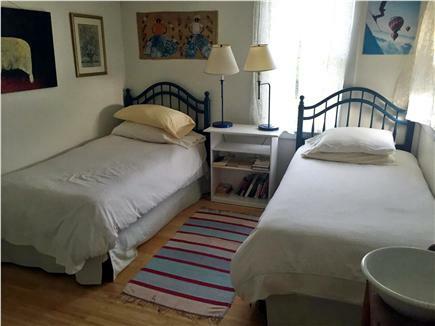 This property stands out as one of the best we have rented in 20 years of vacationing in the US and Europe. The house is in excellent condition. 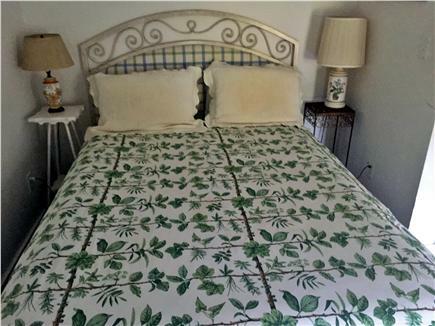 Throughout, the rooms are bright, clean,and tastefully decorated. 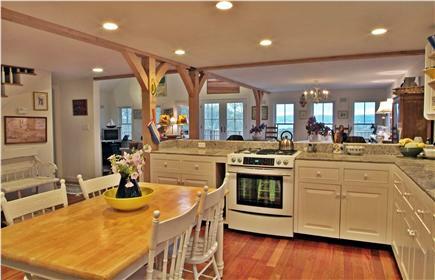 The kitchen is large and exceptionally well equipped. 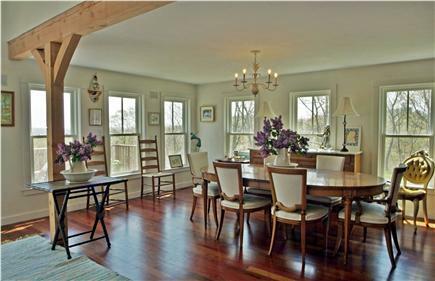 The large, open-plan ground floor is notable for its wooden flooring, many windows, comfortable furniture, and large living room with high ceilings and both a stone fireplace and wood-burning stove. 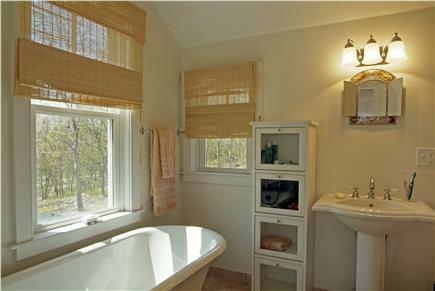 The house is located on 5 acres of secluded woodland offering privacy and tranquility. 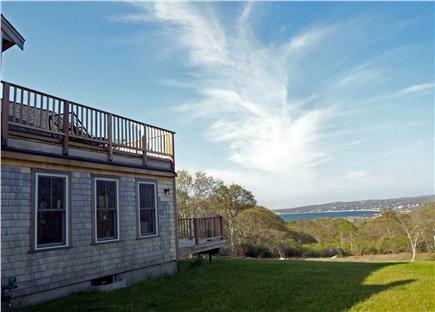 Two cedar decks offer lovely views of the Menemsha bight. 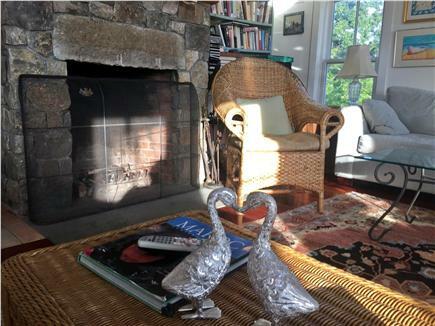 Lobsterville beach, Menemsha pond, Philbin beach and Gayhead are a short drive or bike ride away. The area is one of best on the island for cycling. If you are looking for a home that offers peace and tranquility here it is. We stayed at this beautiful home for an extended Memorial Day weekend. It was a wonderful house to relish some much needed R&R time and share the beauty of this place with friends. 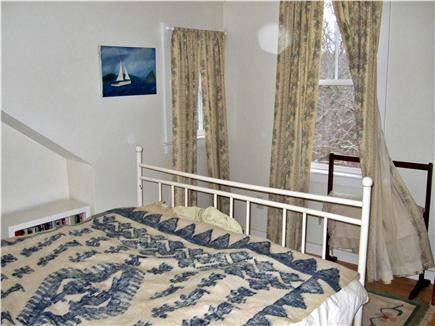 The home is well appointed and equipped, nicely furnished, and decorated with lovely, interesting art. There is easily plenty of space to accommodate a family, group of friends, or 3 couples more than comfortably. The owners were accessible, friendly, and a pleasure to deal with. This home offers a quiet, peaceful setting with a large deck perfect for yoga, sunning, outdoor dining, and just enjoying the view. Oh, the view! 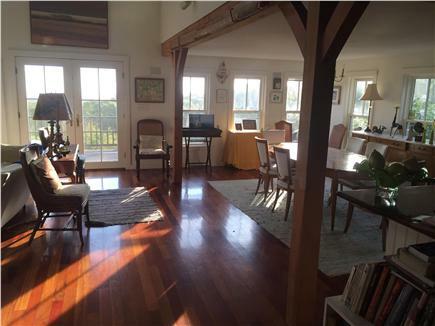 You have such a wonderful vista overlooking Menemsha with mesmerizing sunrises. 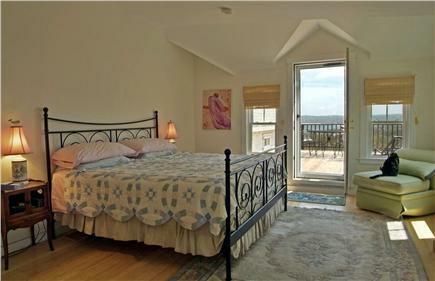 The master bedroom has it's own good sized private deck with the same breathtaking view. The house is clean, open and airy, new appliances, (washer and dryer are a big plus) cable TV, gas grill, and central air conditioning. We've rented this house several times because of its open floor plan, wonderful views, and great size. It's nicely furnished and very comfortable. 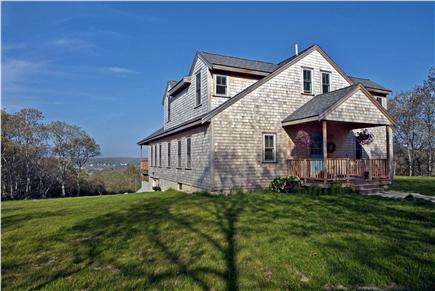 The decks (main one is off the back, smaller one is off the master BR) are fabulous, offering great views of Menemsha. We love this location and home! !